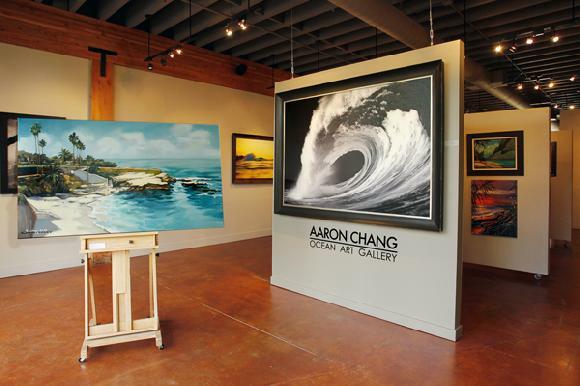 Birthday wishes are in order for both Encinitas and Cardiff, as well as two fine surf art galleries in the area — Aaron Chang Ocean Art Gallery and Green Flash Gallery. Encinitas celebrates its 25th anniversary as an incorporated city on October 1 at the San Dieguito Heritage Museum. Encinitas’ Arts Commission will also host a unique exhibit from July 18 to August 29 at the Encinitas Library, entitled, My Best Friend: Pet Portraits, which will display interpretations of people’s favorite dogs and other pets. Cardiff-by-the-Sea, though technically a part of Encinitas, celebrates its centennial founding as a distinct community on July 2 at Glen Park. It will also celebrate canine culture with its annual Dog Days of Summer on August 13. Now that former Surfer magazine photo editor Rob Gilley has closed his Pacific Surf Gallery in Cardiff Town Center, Green Flash is now Cardiff’s sole surf art gallery. Twin sisters Ash Francomb and Kris DeGrazio, who also own a design consulting business and clothing line, opened Green Flash in July 2010. Located on the corner of a half-block stretch of contemporary live/work lofts (at 111 Chesterfield), Green Flash has expanded to include yoga classes with an ocean view — the only studio in the area with one. The gallery hosts monthly exhibitions, usually group artist presentations. Its next one, on July 14, will focus on Cardiff’s 100th birthday by presenting all Cardiff-inspired works of art. Francomb says that Green Flash opened last year as a ‘pop-up’ gallery. “Our original intention was to keep it only during the summer last year. The space was empty and we were paying minimal rent,” explains Francomb. “The combination of community events like yoga and monthly art events has allowed us to remain open for the long term,” adds Francomb. In Solana Beach, two of the most renowned surf artists are also celebrating their gallery’s one-year anniversary. 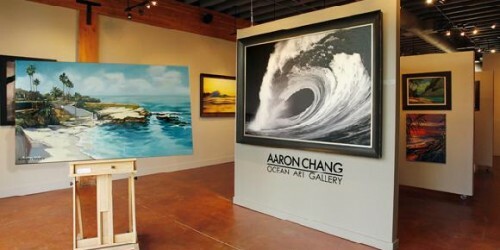 Photographer Aaron Chang and painter Wade Koniakowsky have been open in the Cedros Design District in Solana Beach for several years, but in July 2010, they joined forces and opened the Aaron Chang Ocean Art Gallery on Cedros’ southwest side. The new location is much larger than their previous galleries, and hosts up to four events per month, according to gallery director Thompson Smith. On the same day as Green Flash’s Cardiff art celebration, July 14, Ocean Art Gallery will host a fundraiser for Solana Beach’s public school art teachers. Chang became an overnight sensation as a photographer 30 years ago, shooting from the belly of a spitting, beastly Hawaiian Banzai Pipeline and landing a cover shot on Surfing magazine. Last year, Chang traveled to Cambodia, where he created a photo essay on human trafficking that was exhibited in the gallery, along with Koniakowsky’s interpretive paintings on the issue. “It was a gritty subject presented in a beautiful way,” says Koniakowsky, who on the side is helping raise money for Carlsbad High School’s art department. Asked if he thought that he’d one day have a fine surf art gallery, Chang replies, “My only goal was to be able to surf around the world.” Mission accomplished. And happy birthday.